I’m never quite sure if giving a series an early premiere online is a show of good faith or not, but Black Sails was given the special treatment. Did it need the help? I’m just going to admit right here and now that I enjoy Michael Bay productions. Throw snowballs at me or whatever makes you feel better, but as cheesy as his shows can be, I find them entirely enjoyable. So when I learned Bay would be involved with the Starz series Black Sails — co-created by Robert Levine (Harper’s Island) and Jonathan E. Steinberg (Jericho) — I was immediately interested. The other series the co-creators have been involved with were also fantastic. 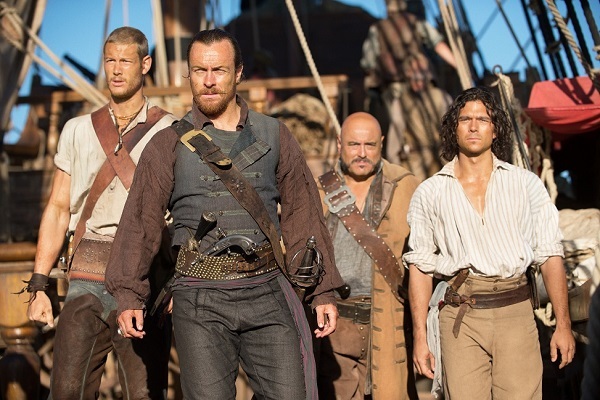 It seems like a situation where these men just can’t lose with Black Sails. Captain Flint takes over a ship with his men in search of the course and schedule that will lead him to the Urca de Lima. John Silver, also seeking the Urca de Lima, is discovered in the bowels of the ship and is taken on as the new cook for Captain Flint’s crew. Eleanor Guthrie runs the local saloon, talks rough and runs things on the island for her father. Captain Vane is fingered as having killed a local, he and Elizabeth Guthrie get into a fistfight over it and he mentions his past love for her. Max, the whore who befriended John Silver, attends to Eleanor’s wounds and seduces her. The most important aspect of any successful television series — in my not-so-humble opinion — is the ability to establish characters that resonate with the viewers. Doing that in a short period of time is also high on the list. Black Sails nailed it. It’s easy to see what Black Sails got from Bay. The opening and closing scenes of the premiere were typical Bay fare — lavishly produced action sequences. The opener was a pirate attack on a ship, and it included sailors falling from crumbling masts and cannonballs hitting their marks. The closer required a sword fight followed by pounding fists with the appropriate bloodletting. Good stuff. From Levine and Steinberg, I see richly written characters that within one hour are already imbued with personality. John Silver (Luke Arnold), who will one day be a villain in Robert Louis Stevenson’s novel Treasure Island, is for now a confident young man. He’s a bit on the cocky side, but he can win you over with a smile while stealing money from your pocket. Still, you’d want to have a drink with him. Captain Flint (Toby Stephens) is a man who has played his cards too close to the vest for too long, and now he’s close to losing the respect of his crew. By his own lights, he believes himself to be aloof, overeducated for his status and unlucky. It’s only when Flint’s third-in-command, Billy Bones (Tom Hopper), lets it slip that the men think he’s weak that Flint springs into action. Bones is the moral compass of the pirates, if such a person can be said to exist. At one point in the episode, he aims a rifle at Flint to keep him from harming someone, but during a later skirmish, Bones mistakenly shoots the man he saved. It’s not a perfect world, by any means. Flint has had his eye on the Urca de Lima, a Spanish galleon carrying millions in cargo, but he hasn’t shared the information for fear of deception and backstabbing. A man on Flint’s own ship ends up getting the information Flint needs most, but it would appear the series will be about Flint and Silver (who has the information) working together toward a common goal, even if not as partners. Perhaps they will be partners — it’s information I’m not privy to! Working on the island is Eleanor Guthrie (Hannah New), who apparently once had a thing for Flint’s rival — Captain Vane (Zach McGowan), one of the “real” pirates of the era. She also has a thing for girls. After Eleanor is in a fistfight with Vane, she is cared for by Max (one of the lovable whores), who’s played by Jessica Parker Kennedy. Max cares for Eleanor with tender, loving care that errs a bit more toward the loving than the tender, if you catch my drift. The unique combination of fictional characters from Stevenson’s novel, real people who sailed the seas and new characters written to interact between fiction and history seems to work really well and makes the show a different kind of history lesson. It helps us imagine what Stevenson was thinking as he wrote his novel while giving us a look at what it was like for real pirates in their heyday, without the romanticized fluff we’ve come to expect. The bottom line is this: I really liked the characters. Everyone who graced the screen was written in a gray area, and there are no good guys or bad guys. It’s the perfect environment where a pirate world can flourish. This microcosm is about to be under attack from civilization, so at the top of the pirates’ priority list is protecting their world. Flint wants the Urca de Lima bounty to fortify his little part of the earth against outsiders — not the pirates’ personal enemies, but the creeping urban sprawl that we suffer every day. It’s too bad we already know how the story will end. The pirates who sail the seas today are not the ones of Black Sails. The premiere gets two thumbs up from me. I think that it was fun and that it created a world I would be interested in visiting, with people I’d want to know. What more could you possibly ask for from a series premiere?